When you get together with extremely funny guy Will Ferrell, you can’t exactly label the experience an interview. It’s more like sit-down comedy, with Will’s sorta answers really a bunch of weird punchlines. That said, there were some serious moments now and then during this conversation about his latest in a string of sports comedies – including Talladega Nights and Blades Of Glory – the lunatic basketball romp, Kent Alterman’s Semi-Pro. This jock mock-doc touches on a variety of trials and tribulations of the Flint, Michigan lovable loser team The Tropics, back in the day of the ABA, in the’70s. And before those grassroots team got gobbled up by the sports business, and corporatized and commercialized, or just plain neutralized. Here Will ponders growing his ‘fro for Semi-Pro; getting campy in more ways than one when he took funk voice lessons from Isaac Hayes to pull off his character Jackie Moon’s singing skills, and his James Joyce Award that may or may not have anything to do with the late Irish literary great’s alleged movie directing talents. That’s a great ‘fro you’ve got in the movie. Is that your hair? WILL FERRELL: That was really my hair. Your singing was real too. So how did you perfect that musical talent for the movie? WF: I actually went to funk camp, conducted by Isaac Hayes. WF: It was up in Vermont.But you never get to hear Isaac Hayes, he’s in the other room. You just hear his voice! And he was like yeah, you’re doing great, you’re lookin’ real good. It’s an incredibly creepy camp, actually! Anything bad happen to you there? WF: You know, I always wanted to do a basketball movie. So this was a dream come true. And I’ve played a lot of basketball. But I’ve never been a ’70s pop singer before! So that was brand new for me. You seem to have a lot of affection for those original ABA players. WF: Yeah, it really was a renegade league, in that all these guys had been passed up by the NBA. And all those teams had the spirit that they really had something to prove, to the more famous league. How about those shoes of yours, on the court? What about having Patti LaBelle for your mom in Semi-Pro, and did she help you with your singing? WF: No, not the singing. But that was a coup, to get her. It was great. And she loved doing it. WF: Good, I’m glad we’re finally getting into this, let’s break this thing open! …So my question is, did anybody on the set get a contact high? Okay…Well, what advice would you give to the NY Knicks? WF: Uh…I would just tell them, let’s save money and just stop the season now. Just take the rest of the year off. Put your feet up. Yeah. Go to the Isaac Hayes funk camp! I hear that you have a degree in sports information. What is sports information anyway? WF: Sports information was basically a journalism degree. I had hopes of becoming a sportscaster. That was what I originally set out to do. But I do love sports, obviously. And I’m not necessarily obsessed with it, but I love making sports comedies. So what is the next sport that you’d like to play in a movie? WF: I’d love to do an expose on a guy who does interviews with a hand held mike, and just travels the world. And…it creates a new sport! What would be your dream place to travel? WF: Uh…The scenic part of Flint. You were presented with the James Joyce Award in Dublin recently. WF: Yes! I’ve already misplaced it. Well, how did that award come about? WF: I was just there with my dad and my brother, to kick around. And then the James Joyce thing just kinda happened. Had you ever heard of James Joyce before? WF: I had! I’ve always been a fan of…his films! I loved what he did with Titanic. And The Terminator. All that stuff. They’re always too long, though! But they just took a wild stab, to see if I would even respond. And they were thrilled when I said, yeah sure. Regardless of the fact that there’s no reason why I should receive that award. Yep. Well, congratulations anyway. So did anybody get hurt playing basketball in Semi-Pro? WF: Maura Tierney got hurt. Yeah, emotionally. But we were good. We had sports psychologists, and people who rub you down. And hypnotists. And a stunt man named Precious. There was an amateur magician on staff too. For some reason. 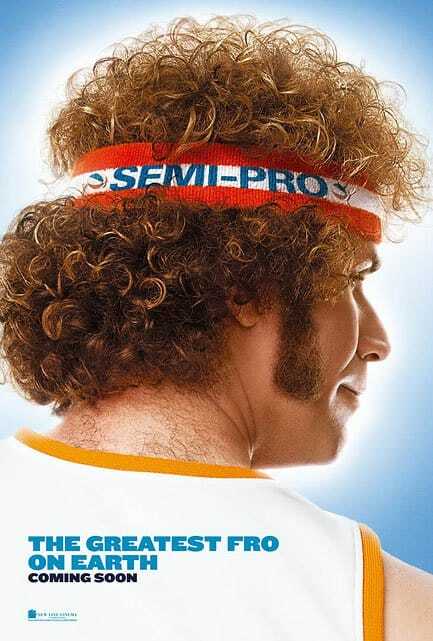 How come your character Jackie Moon is already like a name brand commercial product, it seems? WF: We had no idea that was going to happen. That just came at us, it’s the movie company that does those commercial partnerships. But yeah, this movie was created by Proctor and Gamble. It just makes sense. And I’m doing a Dow Chemical film next. It’s a wonderful costume drama. So what sport will that be? WF: That will be archery. Medieval archery.